The Battle For Whiteclay» Blog Archive » Are beer firms to blame for Native American drink woe? Are beer firms to blame for Native American drink woe? White Clay, Nebraska – After years of failed efforts to address chronic alcoholism, can a $500m (£308m) dollar lawsuit against the beer supply-chain put an end to one tribe’s deadly struggle with alcohol? For generations, the dream of a sober society has eluded one of the largest Native American tribes in the US. Members of the Oglala Sioux tribe, living in South Dakota’s Pine Ridge Indian Reservation, have long tried to shut down the beer stores just across the state line in White Clay, Nebraska. The four beer shops in the tiny town of White Clay (population: a dozen) operate just steps from the reservation. Between them they sell more beer per head than almost anywhere else in the US – a total of about 13,000 12oz (350ml) servings each day. “I’m 52 years old and I come up here because I’m an alcoholic,” says one Pine Ridge resident, Bald Eagle. He is one of several people who spends his days on the street that runs through White Clay, drinking. The White Clay beer stores are the most accessible source of alcohol for members of the tribe, who live on a reservation where the sale or possession of alcohol is forbidden. It has also been the scene of a few horrific crimes. The tribe has led protests and marches to shame the store owners. It has asked for tougher laws that would make it harder to sell and consume alcohol in the area. It has lobbied for stricter enforcement of Nebraska’s existing liquor laws. Nothing has worked, and Pine Ridge leaders have decided to take a new approach. They have filed a lawsuit seeking $500m (£309m) in damages from not just the beer stores, but distributors and breweries as well. The core of the Oglala Sioux lawsuit is an allegation that the big breweries and distributors supplying beer to White Clay knew it would eventually be consumed or sold on the reservation illegally. Tom White, the lawyer representing the tribe, says a combination of factors make it virtually impossible for tribal members to drink their alcohol legally. White Clay and Pine Ridge are extremely geographically isolated. The nearest towns that sell alcohol are more than 20 miles (32km) away and Pine Ridge is the biggest town in the area. In Nebraska it is forbidden to drink in public or a car, and reselling alcohol is illegal. But White Clay has no bars that could serve alcohol legally and only about three private homes where drinking would be permitted. Possessing and drinking alcohol has been totally banned in Pine Ridge reservation for more than 100 years, except for a short period in the 1970s. Nevertheless, bootlegging on the reservation is said to be rampant. The quantities of alcohol being sold in White Clay are so vast, there is no reasonable way it could all be consumed legally, the complaint says. The lawsuit also argues that the drinking, fuelled by alcohol sales in White Clay, has caused devastating harm to the tribe, causing lawlessness and violence, poor public health and anaemic economic development. At the peak of the violence, in the 1990s, a series of grisly, unsolved killings of Oglala Sioux tribe members in White Clay spurred the tribe into pushing for change. Despite their efforts, the situation did not improve. Over the years, scores of people have been killed in drunken brawls and drink-driving accidents. Local authorities say as much as 90% of crime on the reservation is linked in some way to excessive drinking. 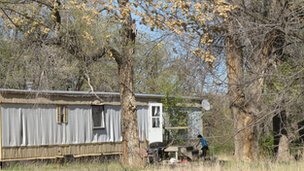 According to the complaint, average life expectancy on the reservation is between 45 and 52 years, significantly below the average US life expectancy of over 77 years. As many as 50% of adults over the age of 40 have diabetes, and the incidence of tuberculosis is 800% higher than it is across the rest of the country, the tribe’s filing says. Meanwhile, it adds, teenage suicide is 150% and infant mortality is 300% higher than the US as a whole. Finally, the complaint alleges that the drinking deters private investment and economic development in the area, whereas unemployment is estimated to be at least 80%. For many residents, alcohol is “the only thing that makes everything go away,” says Megan White Pike, as she points out her own mother among a group of people sitting in the shade on the streets of White Clay. She waves across the street to a cousin who she says is also here for beer. The complaint asks for an injunction to restrict alcohol sales in White Clay to what could be legally consumed, and for an estimated $500m in compensation for damages and social harm caused by the alcohol. The beer companies have until Friday 27 April to respond to the lawsuit, and are expected to ask the court to dismiss the case. They declined to comment for this story. After the deadline a judge has between 30 and 60 days to decide whether to hear the case in a federal court. As the lines get longer outside the White Clay beer stores in the late afternoon, defenders say tribe members need to be responsible for their own choices. “It’s not illegal to buy alcohol at a place that sells it legally,” says Vic Clark, one of the few actual residents of White Clay. He runs a general store there that does not sell beer – but he defends the right of the beer shop owners to do so. For Tom Poor Bear, however, saying that “everybody does it” is no longer a good enough excuse. This entry was posted on Friday, April 27th, 2012 at 9:20 AM and is filed under News. You can follow any responses to this entry through the RSS 2.0 feed. Responses are currently closed, but you can trackback from your own site.